It's a Bash script that lets you download and manage different versions of node. Full source code is here. I used the following instructions to upgrade from Node.js version 0.10.6 to 0.10.21 on a Mac. For production environments you might want to pay attention to version numbering and be picky about odd/even numbers. This four years old post still receives up-votes so I'm guessing it still works for many people. However, Mr. Walsh himself recommended to update Node.js just using nvm instead. After a lot of surfing and not finding a straight solution, I just tried going to Node.js site, clicked the DOWNLOADS button on homepage and executed the installer program (MSI). Thankfully it took care of everything and with a few clicks of 'Next' button I got the latest Node.js version running on my Windows machine. For Docker users, here's the official Node.js image. PS: To check your Node version use npm version or node --version. PPS: Keep an eye on NodeJS blog - Vulnerabilities so you don't miss important security releases. Just go to nodejs.org and download the latest installer. It couldn't be any simpler honestly, and without involvement of any third-party stuff. It only takes a minute and does not require you to restart anything or clean out caches, etc. I've done it via npm a few times before and have run into a few issues. Like for example with the n-package not using the latest stable release. 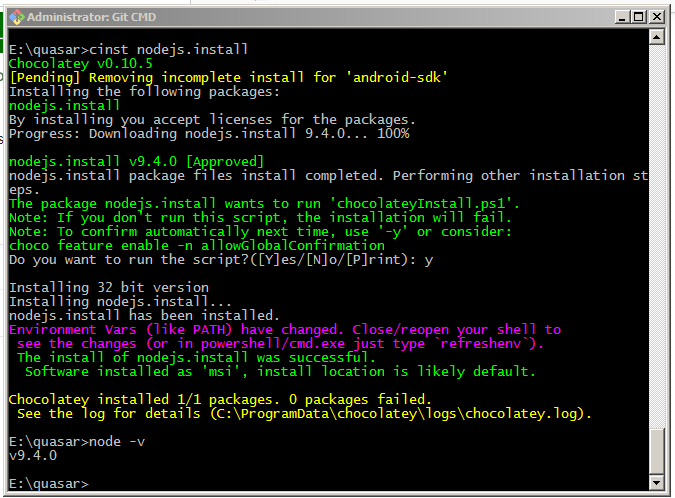 On Windows you can use Chocolatey to install and update Node.js (and lots of other packages). Note: You will need to install Chocolatey before you can use cinst and cup. To control your version of Node.js, you can try n. I found it very straightforward and useful. n is a Node.js binary management, no subshells, no profile setup, no convoluted API, just simple. n 0.6.19 will install Node.js v0.6.19. Download the installer for your platform, then install it. I had the same problem, when I saw that my Node.js installation is outdated. After this node -v will return you the latest available version. Note: The symlink is required to link your node binary with the latest Node.js installed binary file. I then followed the installer and then I magically had the latest version of Node.js and npm. Some Linux distributions such as Arch Linux have Node.js in their package repositories. On such systems it is better to use a standard package update procedure, such as pacman -Suy or analogous apt-get or yum commands. As of now (Nov 2016) EPEL7 offers a pretty recent version of Node.js (6.9.1 which is an up-to-date LTS version offered on the Node.js home page). So on CentOS 7 and derivatives you can just add EPEL repository by yum install epel-release and yum install nodejs. CentOS 6/EPEL6 has 0.10.x which isn't supported upstream since Oct 2016.
nvm ls list the available versions and tells you which version you are using now. nvm use VERSION change the current node to the requested version. nvm alias default VERSION set the default version. The next time you source nvm.sh, this will be the version loaded (note that it doesn't change the version in use right now, run nvm use for that). You may use Chocolatey on Windows. It's very easy to use and useful for keeping you updated with other applications too. Also, you can just simply download the latest version from https://nodejs.org and install it. Simply go to the official nodejs site, download the official nodejs package and install it by double clicking. It's the most simple, safe and always-working thing you can do. Read more about it at https://www.npmjs.com/package/node. Restart your terminal after saving and write nodejsupdate to update to the latest version of Node.js or nodejsupdate v6.0.0 (for example) to update to a specific version of Node.js. After restarting the terminal write npmupdate to update your node package manager to the latest version. Now you can update Node.js and npm through your terminal (easier). If you don't have Homebrew; please go http://brew.sh/. Just install the new version over the current folder. I upgraded mine from v4.x to v6.10 on Windows. In windows download the node executable file from the website and install it. this worked for me. from your Windows cmd prompt. Not the answer you're looking for? Browse other questions tagged node.js software-update or ask your own question. npm command - sudo or not? Does Jest swallow console.log statements? Is there a way to change this? How to update nodejs from 6.x to 8.x?